… and a large part of my preparation for this adventure went into figuring out what pieces of gear I needed to carry with me for 221 miles while keeping my pack weight at or below 30 pounds. Here, then, is my complete John Muir Trail gear list, broken up into somewhat arbitrary categories. Something to carry everything else and keep it all (reasonably) organized. Osprey Exos 58. I saw many of these on the trail. Everyone I talked to loved it. Sea to Summit Pack Cover. Never needed it but glad I had it. Could have saved a few bucks (and probably a little room) with a heavy duty trash bag. A few stuff sacks to organize clothing, essentials, etc. Anything I used while walking the trail. Black Diamond Ultra Distance Trekking Poles. One of these broke in a fall on day four (better it than my arm), so for the next nine days I made do with one pole. At times, that second one would have been nice to have. Goal Zero Nomad 3.5, secured to my pack with two Night Ize S-Biners – Size #1. Repel Lemon Eucalyptus Bug Spray. I’m not convinced this works. Dermatone Lip Balm. Don’t skip this stuff. This one has a carabiner clip for convenience. Osprey Exos 58 pack with Goal Zero Nomad 3.5 (and a bunch of other stuff). Clothes may make the man, but they also weigh down the pack. I packed minimal clothing options, fully detailed here. Mosquito Net (lost on day 10, much to my regret). Nike Fuelband. I’ve since stopped using this thing, but it was fun while it lasted, especially on the trail. All the items of clothing I carried and wore. If you’re not comfortable at night, you can be pretty sure the next day will be crappy. So be comfortable. 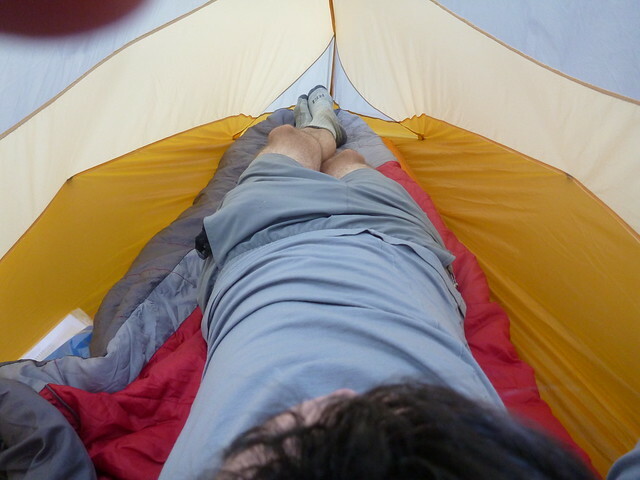 Big Agnes Fly Creek UL 1 (with footprint). Homemade “Rock-Out Loops” for tying down a tent without stakes. Sierra Designs Wild Bill Sleeping Bag. There are better, newer bags out there. This one isn’t even made any more, but I’ve used it for seven years. It’s never let me down. Thermarest Prolite Pad. Another old friend. I briefly considered replacing it with a NeoAir, but I couldn’t justify the expense of a new pad when the one I have works just fine. Maybe next time. Bear Canister — Jam-packed (literally!) with food. MSR Hyperflow Microfilter. Redundant? Maybe. But I didn’t want to take any chances with my drinking water. Nalgene HDPE Bottle. Slightly lighter than the hard plastic version. Playtpus Platy Bottle. By the third day, I hated this bottle. Guyout Designs Squishy Bowl. Left the cup at home. Light My Fire Spork. Green, naturally. Small Towel. For dish washing duty. REI TiWare Mug. Alas, they don’t seem to make this any more. I didn’t really need this, so I sent it home at VVR. This is my bear canister. There are many like it, but this one is mine. Keep it clean — or as clean as possible. Poop Shovel (broken on day three). Next time, I’m going to carry the GG Camp Shovel — GG for Gotta Go, of course. Update: Many people pointed out that the GG Camp Shovel is just a re-purposed snow stake from MSR or JOGR with a bit of paracord. Toilet paper in a Ziploc bag. Two large Ziploc bags for storing used toilet paper (so glamorous) and other garbage to pack out. Hand sanitizer (see point above). Things are going to go wrong. Best to be ready. Adventure Medical Kit .7. Pro tip: Add additional ibuprofen, just in case. And maybe an extra elastic bandage in case you sprain your ankle. And if you’ve had the kit a while check the expiration date of your medicines. Gear Aid Tenacious Tape. Because blowing a hole in the Thermarest or ripping a hole in the tent would be bad. Orange Bic Lighter (purchased at VVR). Know where you are, where you’re going, and who to call. Osprey Map Case. An indulgence, I admit. Silva Ranger 515 Compass. And learn how to use it. Spot GPS. Since I was hiking solo, this provided a little comfort to my family back home. Brunton Nomad V2 Pro. Another piece of legacy gear. I don’t use the compass, but it has a barometer, altimeter, clock, and thermometer. Brunton has a newer version, the Nomad G3 Pro. iPhone. There were a few spots during the first five days I got cell service. Nothing much after the sixth day, though. Map case, map, and compass. When you’re not hiking, cooking, cleaning, or sleeping, there’s a little time to reflect on the day’s events and read up on what’s in store for the next day. Select pages from John Muir Trail: The Essential Guide. Outdoor Knots Duraguide for practicing knot-tying before dozing off. 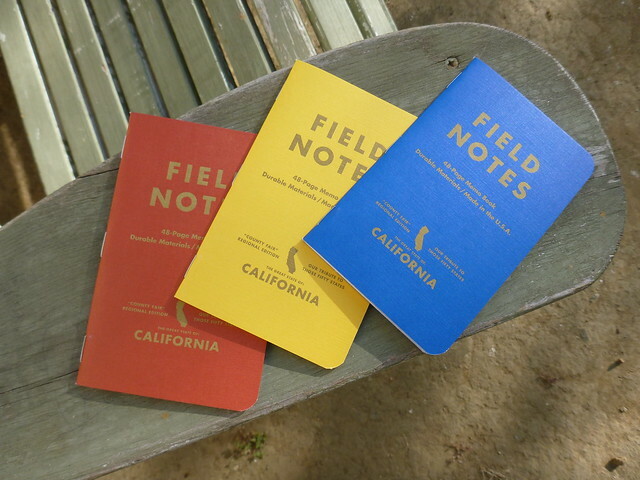 3 Field Notes Notebooks, California edition of course. Sharpie wrapped with duct tape. Extra batteries (AAA & 123A). Night Ize Gear Ties (for cord wrangling). You won’t need these things on the trail, but when it’s all over, you’re going to want to buy some food (at the very least).